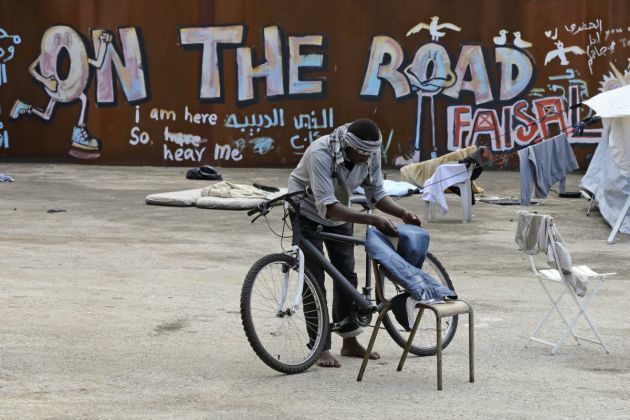 (Photo: REUTERS / Pascal Rossignol)A migrant dries his pants on a chair in a squat opened by activists from the No Borders UK network in a former recycling factory in Calais August 2, 2014. More than 1,000 migrants from Eritrea, Sudan and Afghanistan currently live in Calais and hope to make it across the Channel to England. The squat is planned for evacuation in the next few days by the police, according to a Calais court decision. No Borders UK is a network which aims to fight against borders and immigration controls. The wall reads, "Adventure is Human." More and more churches worldwide are focussing their ministries to on the growing trend of migration which impacts on society as a whole. To help deal with this the World Council of Churches has organized a meeting at its Ecumenical Institute in Bossey near Geneva, the WCC said in a July 31 statement. "Migration constitutes a global reality," said Dr. Amélé Ekué, the seminar organizer and faculty member at the Ecumenical Institute. "People leave their countries of origin due to situations of war, environmental factors and persecution. "Churches have become increasingly aware of these movements, as they call for the protection of migrants' rights and care for their needs in situations of vulnerability," she noted. She said the migrant church communities in all parts of the world have create "a fascinating new terrain for ecumenical encounters," Ekué said. The meeting will focus on evaluating experiences and devising new approaches to theological education that can help churches understand migration as an opportunity of "being the Church together." The seminar will take place from September 1 to 5 and will be titled "Evaluation of Ecumenical Theological Education Programmes for Migrant Church Leaders." It will bring together some 20 participants from migrant churches, Christian organizations and non-governmental organizations. Participants in the conference come from diverse ethnic backgrounds and from such countries as Sierra Leone, Nigeria, Togo and Guyana, while they serve Christian ministries in European countries. They represent churches and organizations from Switzerland, Germany, Belgium, Guinea, Indonesia, Italy, United Kingdom, Sweden and the Netherlands. "The time is ripe for reflection on and analysis of different initiatives in ecumenical theological education related to migration," Ekué said. Participants in the seminar will share the lessons, challenges, success stories and good practices from their work among migrant churches. They will discuss ideas for innovative ecumenical theological education that can better serve the mission of the church in the changing global landscape of Christianity, Ekué said.